1. I'm very afraid of the gigantic ball of fire. Not because of skin cancer; I hate sweating and it annoys me to no end! 2. I can't cook a decent meal. I'm useless at following written instructions, which in this instance are called recipes and my cooking skills are non-existent, or almost so. 4. The piano amuses my ears. My dad bought a piano for me and sent me to class. However, I stopped piano lesson because I had chickenpox and hence I gave up after grade 2. 5. I'm not a morning person. So don't be surprise to see me at your blog in the wee hours. 6. I love to drive fast and watch race car movies. It's stimulating! 7. I'm a coffeeholic. I've adopted drinking a cup of 'Joe' as a daily ritual to start my engine and throughout the day. Without 'Joe', I'd be dead. Okay, I won't be tagging anyone. I just need a cuppa coffee now... anybody wanna join me? so now we know who are you!!! Interesting facts and thanks for the insight! Now you know, huh.. ;-) anyway, thanks for being the 1st commenter Bono! hey, nice to see you here today ;-) I hope we've four breathtaking seasons for me to enjoy here... hehe! Thanks for joining me for a cuppa hun! Use microwave only? Yay I like! LOL!! I went to Langkawi to enjoy life but I didn't enjoy the hot weather..hehe! I can definitely emphasize with you on #2. I can't either!! Congrats Bono on being first!! 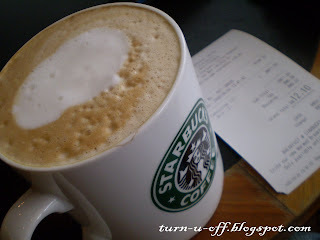 Oh I love Starbucks coffee :) thanks for sharing about yourself.